Honeybee foraging on Borage. Photo by Mary Lou Chase. Attract honeybees into your yard by planting a bee friendly garden. Your vegetables will thank you. Spring is fast approaching and if you are a gardener like me you are thinking about how quickly you can get your hands in the soil and get some plants in the ground. I’m reminded of years past and my struggles to grow certain crops. Despite my best efforts, cucumbers were always absent from my garden harvest. Year after year, no matter how hard I tried, I could not get any cucumbers to grow. After I became a beekeeper, the reason for my cucumber troubles became apparent, what was missing from my garden were the honeybees. Now I always think about how I can accommodate more bee friendly plants and flowers into my yard to make a sanctuary for honeybees and other beneficial pollinators. This is as easy as planting a small patch of native wildflowers, herbs or even a flowering vegetable garden. Keep it chemical free, let it continue to flower and you will be providing a vital food source for the local bee population. As an added bonus you’ll get your vegetables well-pollinated and have an excellent harvest at the same time. Just follow these simple guidelines. Choose plants that attract bees – Bees love native wildflowers, flowering herbs, berries and many flowering fruits and vegetables. Some honeybee favorites here in Massachusetts include – mints, basil, sage, thyme, borage, oregano, lavender, chives, buckwheat, berries, strawberries, blueberries, raspberries, blackberries, cucumbers, tomato, winter squash, pumpkins, melons, watermelons, flowering broccoli, crocus, snowdrops, jonquils, tulips, sunflowers, asters, dandelions, clovers, lilacs, wisteria, cosmos, black-eyed susans, gaillardia, cup plants, goldenrod, loosestrife, bachelor’s buttons, bee balm, sedum, peony and honeysuckle. If you have the space, planting any type of fruit tree is perfect and trees such as maple, willow, black locust and sumac are also good food sources for bees. Planting Snowdrops or Siberian Squill in your yard is another simple way for a suburban gardener to provide an early spring food source for bees. Read more about it in Blue Pollen, Honeybees and Siberian Squill and Snowdrops for Bees. Group the same plants together – Try to plant at least one square yard of the same plant together to make a perfect bee attractor. But if you are short on space planting just a few wildflowers or herbs in a planter or window box is all that’s needed to provide more foraging habitat for the honeybee. Pick plants with long blooming cycles – Or choose plants with successive blooms. This way the bees will keep coming back again and again. A seed kit like this makes attracting bees to your garden easy. Let your plants flower – Leave the flowers on your plants and deadhead them to allow the honeybees to get the pollen and nectar they need. If you are growing herbs or vegetables such as broccoli, harvest it but leave the plant intact. When you are done let it go to flower for the pollinators and leave it in the garden until the flowers are gone. Last December, I saw firsthand how important a food source like broccoli left to flower in a backyard garden was to my honeybees at a time when nothing else was available for them to eat. Provide a fresh water source – A sloping bird bath with stones for bees to stand on, a backyard waterfall, a pool, a dripping hose, almost any shallow water source will do. Cabbage and broccoli leaves full of fresh morning dew, and newly watered potted plants with peat soil are favorite destinations for my bees. DO NOT use pesticides, herbicides or other chemicals in your garden – Or anywhere in your yard including your lawn, other gardens and trees. After all, you are trying to attract bees right? Most of these chemicals are toxic to bees and have widespread effects which are detrimental to plants, beneficial insects and other native pollinators. This ban also applies to products your lawn care company uses. When in doubt leave it out. This article explains how toxic some backyard chemicals are to bees. Appreciate the beauty of weeds– Dandelions, clovers, loosestrife, milkweed, goldenrod and other flowering weeds are very important food sources for bees. In areas filled with green sprawling lawns, dandelions and clovers are vital plants for a bees survival. Let them grow and flower in your yard and you will soon have your own personal honeybee sanctuary. The next time you see a dandelion going to seed, grab it, blow those seeds around and feel good knowing you are doing your part to help save the bees. It can’t be more simple than that! Honeybees enjoying my wildflower garden. In the picture above, my bees are on a poppy flower planted in my wildflower garden. 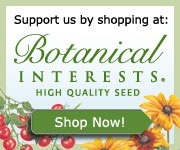 If you enjoy this post, would like to support this blog and need to buy seeds for your bee friendly garden, please click on the Botanical Interests box below. Your cost will be the same and I may receive a small commission for referring you there. Plus all Botanical Interests seeds are bee safe so you can feel confident knowing you are buying safe plants for your bees! Thank you for your support! Our bees love peony’s. we love watching them roll around in the opened flower. What a great visual Tara! I’ll add that to my list. Hi Deborah, You can purchase some of the flowers through the links on this post. The bee friendly seed packet is a great one to get. Thanks!